Home European Destinations Belgium Un Week-end Merveilleux à Bruxelles! The latte and smoked salmon and scrambled egg bagel we grabbed at St Pancras somewhat compensated for the rude awakening at 05:00 on Saturday morning. Getting on the first train to Victoria, then the London Underground to St Pancras allowed us to board the 08:58 Eurostar service to Brussels. After a quick journey through the garden of England, and under the English Channel, we were soon flying through stunning French and Belgian countryside, whilst sipping champagne and enjoying a snack of saucisson. We arrived at Brussels Midi station just two hours later, a few minutes after midday. Brussels – Un Week-end Merveilleux à Bruxelles! We took a taxi to the Royal Windsor Hotel Grand Place, and after an effortless check in we went straight to our room, rather than wait over two hours until the usual check in time. We had a premium room, and although no bigger than their classic room, it was far more luxurious in its appointments. We had not appreciated just how close the hotel was to Le Grand Place. We were pleasantly surprised with having only a two-minute walk from the hotel to the square. The one thing we had noticed almost immediately was that Brussels had a strange, but lovely sweet smell to the air. Could this be the endless chocolate shops, or breweries making over 800 different varieties of beer? The one thing I know is that it’s a lot nicer than the smell of pollution you can find in many large cities. As we explored the local area we discovered some narrow streets, just off the square that were lined with restaurants as far as the eye could see. All of their specials boards displayed many varieties of moules-frites, considered by some to be the national dish of Belgium. On our walk we also came across the Galeries Royales Saint-Hubert, a high-ceilinged shopping arcade, constructed in classic Italianate style, with a glazed roof allowing the sunlight to stream into the arcade and through the windows of the many Belgian chocolate boutiques found here. All the chocolates in the windows had made us realise just how hungry we were, and returning to the area with all the restaurant-lined streets, we found a restaurant called Saint Laurent, located on an alley called Bouchers Beenhouwers. We opted for their 18€ two course set menu. I had the grilled king prawns, followed by moules-frites accompanied by a couple of dark Belgian beers. When we asked for the bill they gave us Belgian waffles with chocolate sauce and cream, on the house… perfect! A short walk from here took us to Saint Michael and Gudula Cathedral, located a few minutes off the Le Grand Place, near Gare Centrale. It’s open daily and the entry is free. 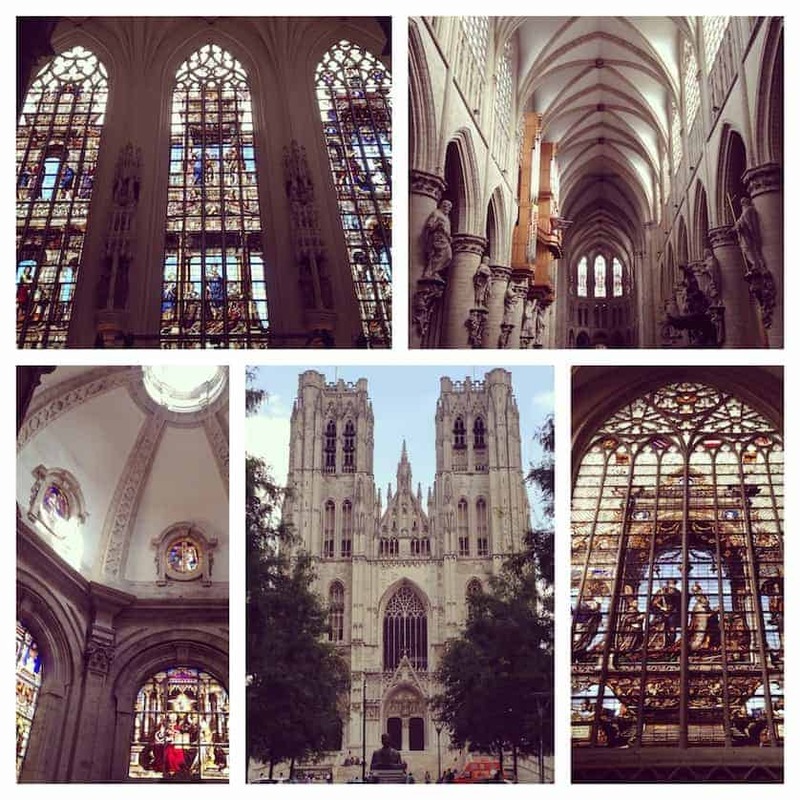 Each side of the cathedral has endless amazing stained-glass windows, the intricacy and beauty of which are breathtaking. On the way back to the hotel we took a detour to see the Manneken Pis. The Manneken Pis is a fountain which includes a bronze statue of a small boy who is urinating. There are many legends behind the meaning of the statue, and because of these legends the fountain has often been regarded as one of the most iconic symbols of Brussels. At this point, and after such an early start, we needed a small nap and some chill out time, so we returned to the hotel. Once we had fully recharged our batteries, we remembered that earlier in the day we had passed the Hard Rock Cafe, conveniently located between our hotel and Le Grande Place. Given my love for Hard Rock Cafe it wasn’t difficult to persuade me to go there for dinner. There was an hour or so wait-list for a table, and so we put our names down and then grabbed a beer outside in a small bar just off the square, so we could savour the last of the evening sun. An hour later we returned to the Hard Rock Cafe, and had one drink at a bar before we were seated. We were lucky enough to be given a window table on the first floor, looking out over Le Grand Place – the best view in the house! We had one of their sharing platters to start and then I had the beef and shrimp fajitas, washed down with quite a few of their Long Island ice teas (my favourite cocktail). After my obligatory purchase of a Hard Rock Cafe T-shirt, we left to find a sound and light show illuminating all the buildings in the main square, accompanied by traditional style music. After soaking up the atmosphere of this spectacle we enjoyed a few drinks at a bar on our way back to the hotel. After such a long day, and a late night, I have to admit that I didn’t wake up until late morning the next day. It was a very welcome rest. With a quick shot of caffeine in our system we then headed out and explored more of Brussels, starting with the Royal Palace of Brussels. It was about a 20-minute walk from the hotel, but definitely worth the effort to see the grand neoclassical palace that looks over Brussels Park. We saw people walking through the gates and into the palace, so we followed and found out that part of the palace is open to the public during the summer, with free entry. There was a set route to take through the palace, leading through small music rooms to lavish reception areas and even a grand ballroom. 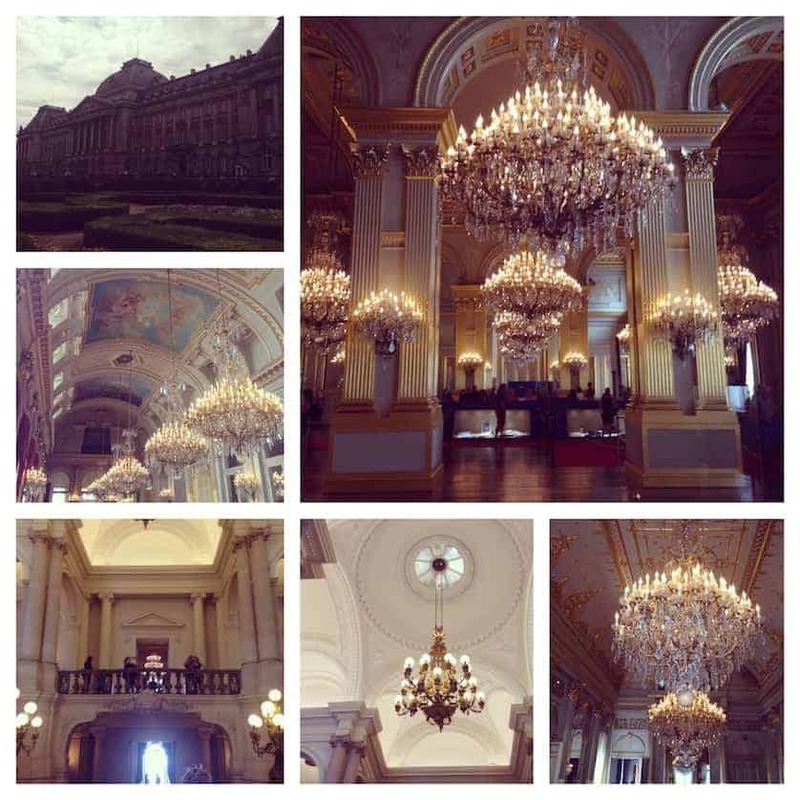 The intricately detailed ceiling mouldings and the numerous chandeliers found in each room were exquisite. After we had finished looking around the palace we decided to walk back through Brussels Park, and then on towards the Le Grand Place to find somewhere for lunch. Still not being overly hungry I decided just on just moules-frites, but rather than the creamy moules marinières I had yesterday, I went for the moules Provence, which consisted of a tomato-based sauce with mushrooms and herbs – I think I enjoyed these ones more! After lunch, despite our full bellies we settled for an afternoon of Chocolate and Beer! First we visited the Musée du Cacao et du Chocolat, located on Rue de la Tête d’Or, just off the La Grande Place. Entry to the museum was 5.50€. The museum was established by Gabrielle Draps, the wife of Jo Draps, who is the founder of Godiva. When you first arrive you are allocated a time for the chocolate demonstration. While you are waiting for the demonstration you can wander through two additional floors full of information and artefacts all about chocolate; where it comes from and how it is made. When the time comes for the demonstration, you are shown into the chocolate kitchen and given a demo on how to make chocolates with filled centres. I won’t give you the details about this or I may ruin your visit! Afterwards you are invited to try one of the chocolates, and they were divine. On the way out there are some bowls of chocolate for you to taste, and these range from the raw product to various strengths of dark chocolate, and also milk and white chocolate. The beer museum is only a short walk across the square and entry was 5€ which included a glass of beer to complete the experience. 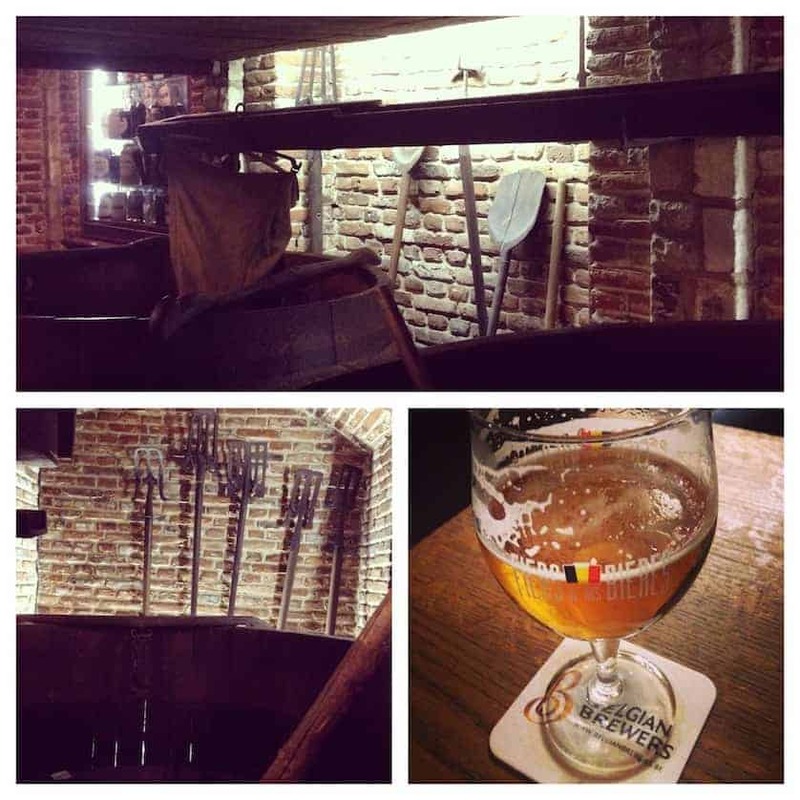 A video presentation showed how the beer is made, its history and also its importance to the Belgian culture. We were given a booklet explaining all of this, and much more, in detail. There were other small video screens showing the process of beer-making, and there are display boards with various information, as well as artefacts of the beer-making process. When you have taken in all of this information, you can collect your beer from the bar and enjoy it in the rustic surroundings of the bar area. After all the walking, relaxing at the hotel before dinner was essential, as was a cheeky glass or two of wine. Rue du Marche aux Fromages leads from our hotel to Le Grand Place and is lined with bars and restaurants many of which are Greek. I hadn’t eaten Greek food in ages, but having walked down this street a few times every day, I found that a craving for Greek cuisine had been steadily growing and growing. We picked one called Mykonos for dinner, but before eating we visited a bar a few doors down called Au Brasseur. Earlier in the day, we had noticed that they served tasting trays with 6 different local beers, so we thought we would give it a go. From pale beers to dark beers, all with their own unique flavour, and I just couldn’t decide which I liked best. I don’t know if it’s because we ate so much the previous day, but again at dinner we were not very hungry, so we just ordered a platter of mixed meze and then a mixed grill platter. The food was excellent, and the price was even better; less than 20€ each including beers and wine. After we had eaten we wandered around to the main square to view the sound and light show we had seen the previous evening. The shows are on at 22:30 and 23:00 daily during the summer. The next morning we got up much earlier as we wanted to go and visit the Atomium, known as the symbol of Brussels. The Atomium was designed by André Waterkeyn and built for the 1958 Expo. The Atomium is 102 meters high and was designed to replicate an atom. It comprises of 9 spheres, of 18 metres in diameter, with connecting tubes which house; stairways, escalators, and elevators that provide access to the meeting areas, exhibits, view points as well as a restaurant. Instead of going to the Atomium by taxi we decided to try out the Brussels Metro, and it really couldn’t have been any simpler. Our nearest Metro station was in Gare Centrale, a stone’s throw away from the hotel. The system is very simple: you buy a ticket – single, return or a day pass – from a ticket booth, or a machine (single tickets are 2.20€). Then all you need to do is validate the ticket on a touch pad before getting on the train, much like you have to with an Oyster card on the London Underground. We had 5 stops on either line 1 or 5, and then had to change on to line 6 with 8 further stops until we arrived at the stop called Heysel. All in all it took about 20 minutes. The Atomium is about a 10-minute walk from this station (also located here are numerous exhibition halls as well as Mini-Europe). 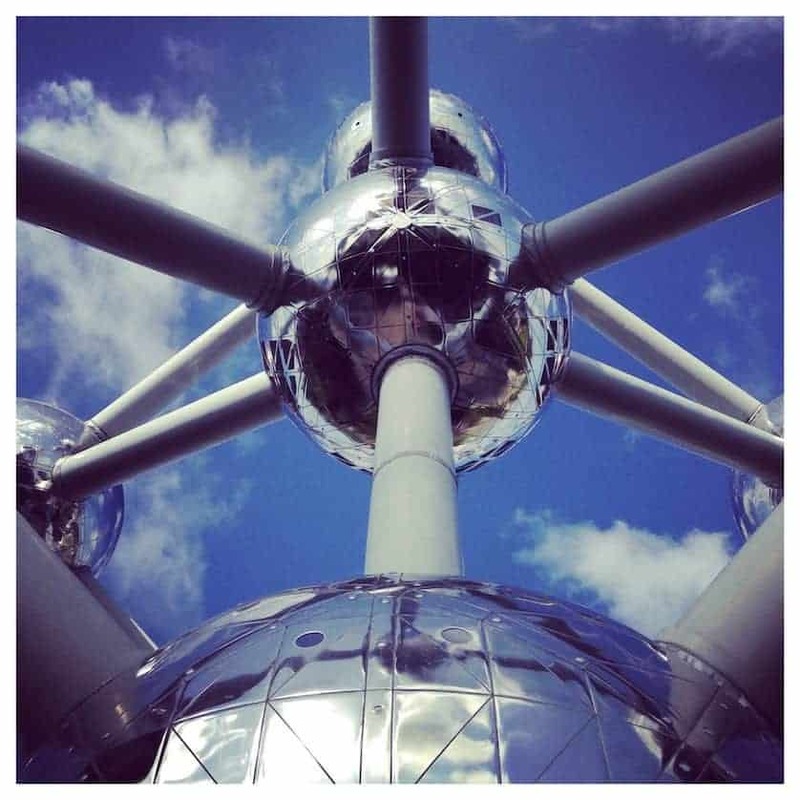 The entry into the Atomium is 11€ per adult, and they have reductions for children, seniors and students – don’t forget your international student card! They also do combi-tickets offering you entrance to the Atomium and Mini-Europe at a reduced rate, but due to time restrictions we only had time to visit the Atomium. I recommend getting here early (it’s open daily from 10am) as the queue when we arrived, just after 10am was about 20 minutes to the ticket office, and when we left just after midday the queue was at least 3 times longer. Upon entering the Atomium you must first pass through a metal detector, like you would at an airport, then you are ushered into a lift that takes you 92 meters above the ground, to the highest of the 9 spheres. Here there is a look out point with spectacular views over Brussels, and also a bar/restaurant. We stopped briefly to savour the view and enjoy a nice chilled glass of white wine. From here we took the elevator back to the bottom and we were shown to an escalator that took us to the lowest of the spheres, and then on from here we headed through three more of the spheres, accessed by a range of escalators and stairways. 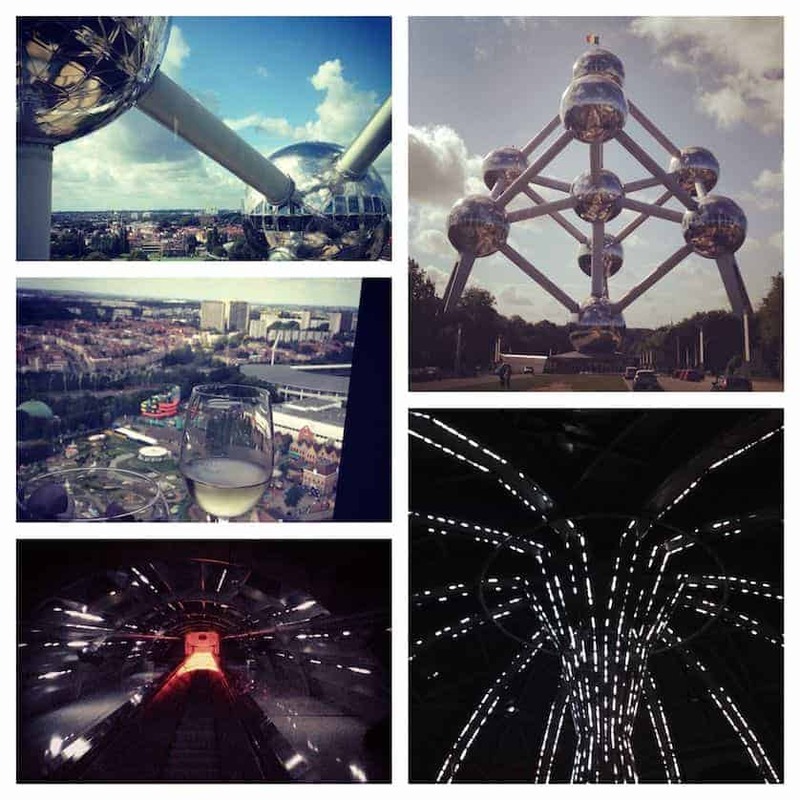 In the first of the spheres that you visit on the tour route you can see items such as designs and concepts for the Atomium as well as the other pavilions that were built for the Expo, and items of memorabilia from the expo itself. Then onto the second pavilion for a sound and light show by Thomas Vaquié which was fascinating to watch. In the last of the spheres there is a range of sleeping pods, which are used by local schools and groups as a ‘sleep-over’ area for children. Along the way there are many more vantage points for great views over Brussels, and fantastic photo opportunities. After we had finished the tour we headed back to the hotel on the Metro to get packed and check out; the joys of late check out and early check in! With a couple of hours spare before our train departure we left our bags at the concierge and headed towards Le Grand Place one last time to get a few goodies to take home and to grab a bite to eat. Our journey home began with a local train from Gare Centrale to Gare Midi and then the Eurostar to London. 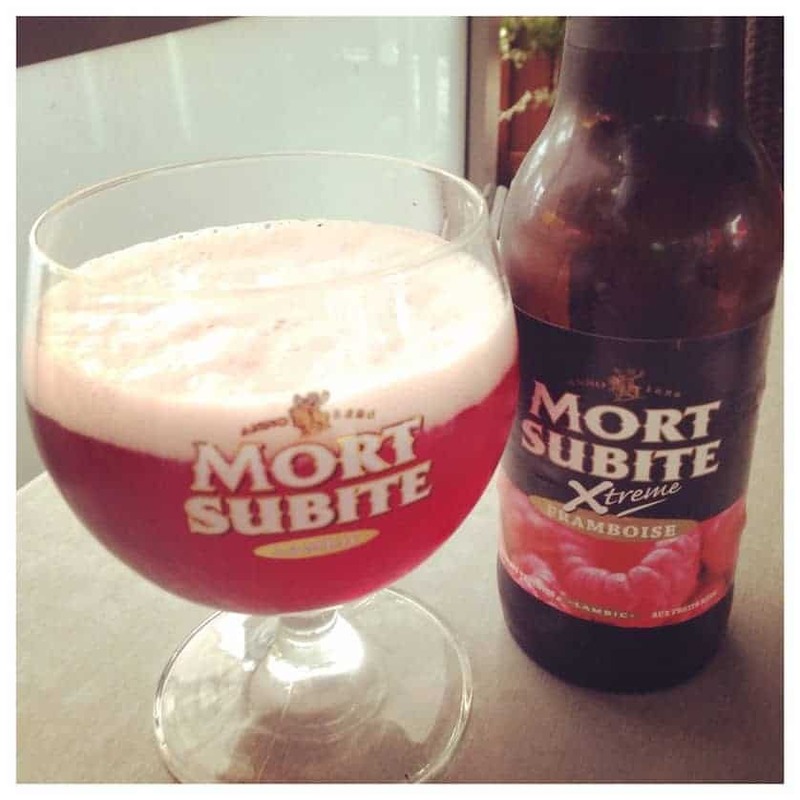 We had a bit of time at Gare Midi, just long enough to try a raspberry beer. Two hours later we arrived in back in the hustle and bustle of London, and had to fight our way on to the underground to get to Victoria station to catch our last train home. Another lovely weekend away, but as always it ended far too soon. 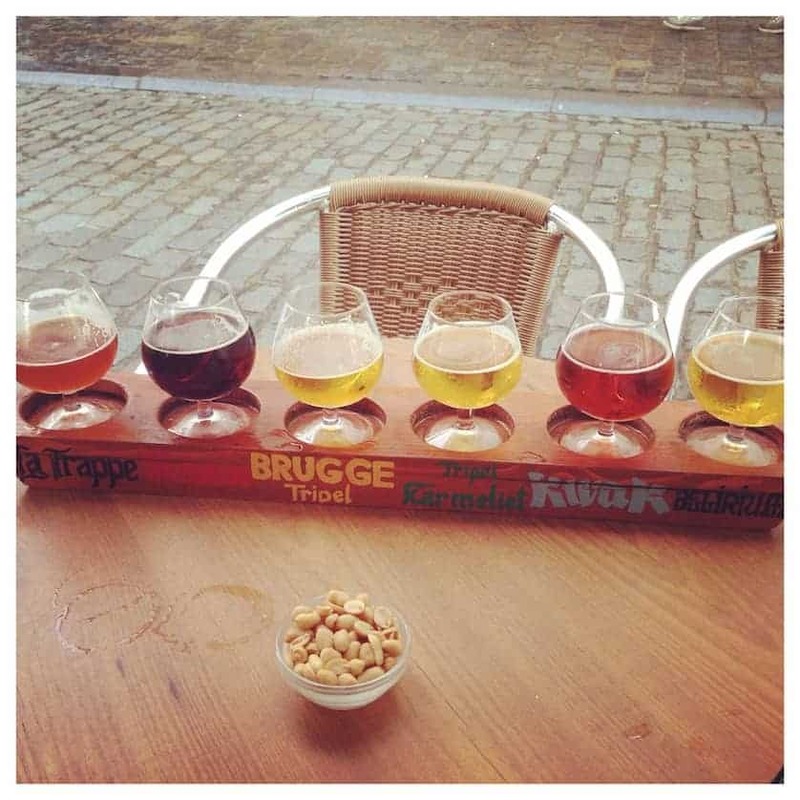 I found Brussels to be a fragrant, chilled-out place! 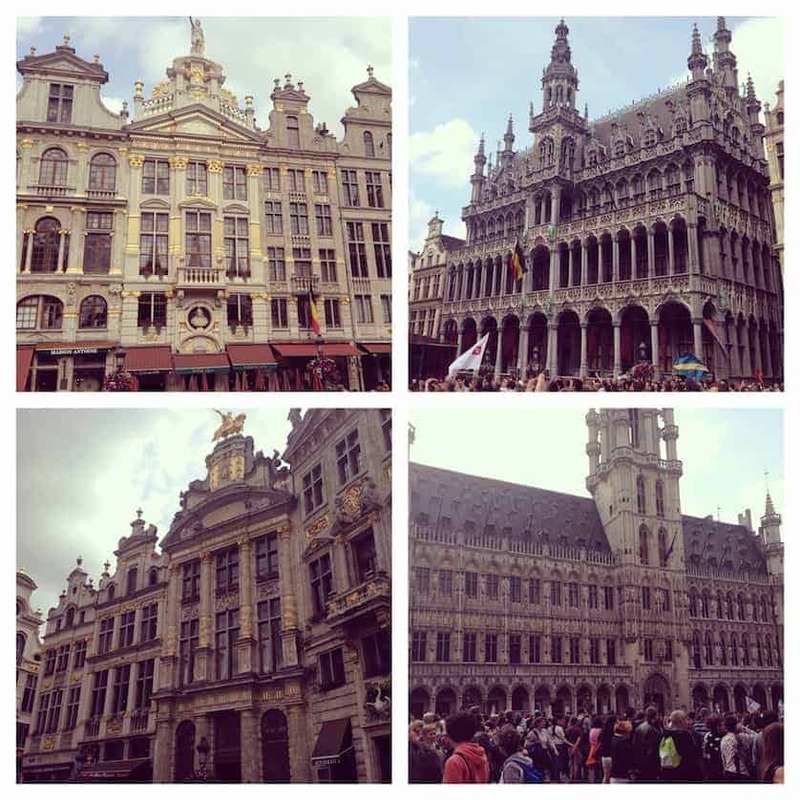 Brussels is so easy to get to, and if you are in, or around London, the Eurostar is such an easy, hassle-free option delivering you straight into the heart of the city. Lastly, and on another note, I was uber-impressed to find that the Eurostar’s onboard bar stocks Waitrose products. If nothing else this is enough incentive for me to travel on it again! Wow, you sure fit a lot into one day! Some great photos you have as well. Have to be careful with that beer! It gets dangerous! I try! I love to see and do as much as possible when I’m on my travels! I know, nearly as dangerous as the chocolate!! !